Brussels, 17/09/2018: A SAFE-owned website on stroke prevention and modifiable stroke risk factors goes live today at www.strokeprevention.info. “We know from the INTERSTROKE study that 10 modifiable risk factors are responsible for 90% of strokes. Our goal is to increase awareness and behaviour change by creating an online resource that will collate all relevant information on the most common risk factors such as: hypertension, physical activity, diet, obesity, smoking, cholesterol, heart disease, alcohol, stress and diabetes.”- said Jon Barrick, the President of SAFE. This website is a platform which contains all the relevant information on stroke risk factors in an easy and simple format for a range of audiences. All information presented here are in a form appropriate for people with busy lifestyles, unable to digest too much detail at one time, as well as people with disabilities. 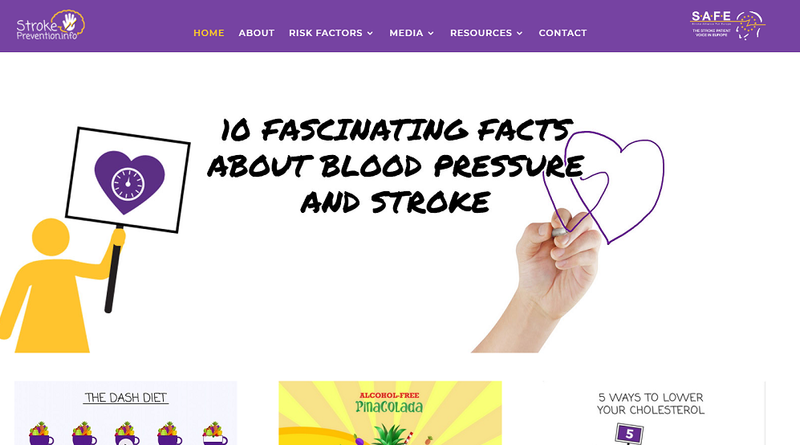 Prior to developing this website, our research showed that it was difficult to find consistent and coherent information about stroke prevention in one place online. The problem is that the information is spread across a vast range of different locations: websites, blogs, news portals and e- documents. In addition, many of them are not in a format appropriate for people with disabilities, for example sight impairment. Note: This website is developed and owned by Stroke Alliance for Europe – SAFE, supported by an educational grant from AMGEN. SAFE retains full editorial control over the content of this website. The Stroke Alliance for Europe (SAFE) a non-profit-making organisation formed in 2004. It is the voice of stroke patients in Europe, representing a range of patient groups from 30 European countries. SAFE’s goal is to decrease the number of strokes in Europe by advocating for better prevention, access to adequate treatment, post-stroke care and rehabilitation. For more information about SAFE, please visit www.safestroke.eu. Amgen is committed to unlocking the potential of biology for patients suffering from serious illnesses by discovering, developing, manufacturing and delivering innovative human therapeutics. This approach begins by using tools like advanced human genetics to unravel the complexities of disease and understand the fundamentals of human biology. Amgen focuses on areas of high unmet medical need and leverages its expertise to strive for solutions that improve health outcomes and dramatically improve people’s lives. A biotechnology pioneer since 1980, Amgen has grown to be one of the world’s leading independent biotechnology companies, has reached millions of patients around the world and is developing a pipeline of medicines with breakaway potential. For more information, visit www.amgen.com and follow www.twitter.com/amgen. SAFE retains full editorial control over the content of this website.